The Civil War is easily the darkest, most fascinating chapter of American history. Its horrors have reverberated for more than 150 years, and the events of the war continue to affect families today. In Ancestors in the Attic, the descendants of Union soldier James Atwater Barrett share a breathtaking collection of letters, diary entries, photographs, and other historical documents that together tell a story of love and war. A clerk in New York at the onset of the war, twenty-nine-year-old James Atwater Barrett felt duty bound to enlist in the Forty-Eighth New York Volunteer Infantry. What followed was four years of battles, sickness, and near-fatal wounds. Meanwhile, Barrett's fianc e, Jane Farmer, wrote with love and concern from his hometown of Concord, Massachusetts. Consisting almost entirely of primary sources, Ancestors in the Attic provides a stunning look at a soldier's life during the Civil War. Barrett participated in many famous battles, including the Battle of Fort Wagner, and even watched famous nurse Clara Barton tend to the wounded. Anyone interested in the Civil War will relish in this detailed account of one man's survival through America's bloodiest conflict. 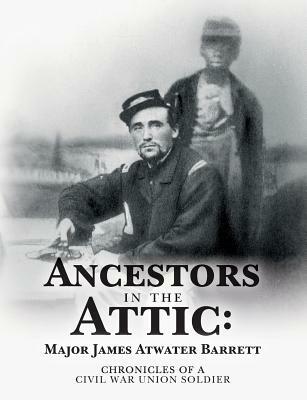 Many of the writings in Ancestors in the Attic were penned by James Atwater Barrett, but his descendants wrote the foreword and compiled the historical materials for this remarkable book. They all live in California with their families. Leslie James Peterson is a retired sales professional. He received his BA from California State University at San Francisco. Linda Joe Peterson received her BA from California State University at San Francisco and two MA degrees from California State University at Los Angeles. Meliscent Peterson Gill, a retired educator, received her BA from California State University at San Jose and a MA from the University of Southern California. Patricia Louise Peterson is a retired middle school and high school educator. She received her BS from California Polytechnic State University at San Luis Obispo, her BA from California State University at Sacramento, and an MA from California State University at Los Angeles.